If you're a blogger, you know how much time and effort goes into blogging. It's not just writing, but also photographing, editing, designing, promoting, networking, pitching, organizing events, etc., etc., etc.. It's a full-time job getting your blog high in your reader's lists, and you're likely also losing money with hosting and domain costs. If you've been wondering how to monetize your blog, I can help. You won't get rich quick, but you'll start by making enough to cover your blogging costs and your time. :) There are many bloggers out there who make a full-time income, and then some, but it takes a lot of time and a lot of hard work. Using these methods, I hope to start earning a full-time income from blogging while also being able to stay at home to care for my family. I get asked constantly how to make money online, so I thought I would share everything I've learned in one place. It became a monster of a post, and was hard to get through, so I broke it up into 6 easy-to-digest pieces continuing with #5: Running Giveaways. This is not something you would usually charge for since having a giveaway on your blog is its own reward. Your readers become more excited, you gain traffic (if promoted properly, see this post on Where To List Your Giveaways), and you grow your social media, all by being able to reward one of your readers with a fabulous prize! I wouldn't run a giveaway without a review unless I know the product to be of good quality. In this case, I would charge for time. The company might not understand what goes into setting up and running a giveaway, so you may want to list what will happen for that fee, and it all depends on how much time and effort you want to spend, and how big you'd like it to become. For a single blog giveaway: Manual set up of the giveaway widget, writing and linking the post, creating images for the post and sidebar, and social promotion throughout the giveaway period. That's the kicker since promotion can take several hours over several days if done properly, so charge according to what your time is worth, because they'll be getting a lot of exposure from it. Don't forget generating a winner and validating entries, which can also take hours, or even days, if you have to re-draw many times. I can't give you a hard-and-fast rule for this, but you should take into account the value of the product and how much you will gain from the endeavor, Obviously a high-value product will bring you more traffic and help grow your readership, so take into account that you will benefit as well in traffic and promotion for yourself. I would say that charging $25 - $50 for a single blog giveaway is fair as the work is not as intense, but you'll have to use your own judgement if approached to run a multi-blog giveaway since it really can be as big as you make it. There are also platforms through which you can apply to run giveaways. 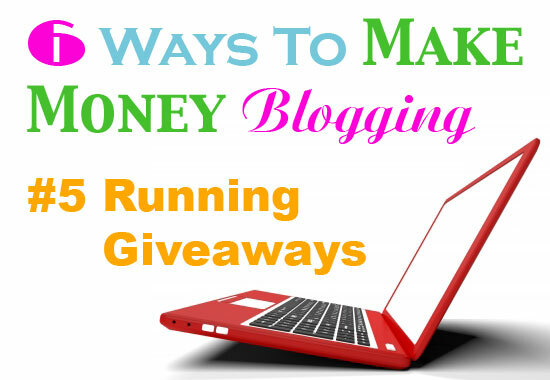 The two I've found are Giveaway.ly, which focuses specifically on running giveaways, and Mom's Affiliate, which offers affiliate programs, articles to apply to write, and has just started a giveaway section, in which you can apply to run unpaid giveaways. I hope this post has been helpful, and I'd love to hear about your successes! Please leave me a comment below or you can email me at southernmomloves@gmail.com! Good Luck!